The Vancouver British Columbia Temple is the 133rd announced temple of The Church of Jesus Christ of Latter-day Saints. 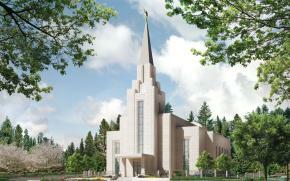 On May 25, 2006, the First Presidency of the Mormon Church announced plans to build a new temple in Vancouver, Canada. When completed the temple will be the seventh temple in Canada. The Vancouver Temple will be the first temple in British Columbia; currently members in this area travel into the United States to attend the Seattle Washington Temple. Currently there are more than 172,000 Mormon Church members in Canada. A site has been selected in the area of Langely. The Church has acquired the land, and plans have now been presented to the Township. The approvals came in the early summer of 2007. The site is 10 acres on the biggest hill in the area and will also include a new chapel. A groundbreaking ceremony was held on 10 August 2007. In December, 2009, The First Presidency of the Church announced dates for a public open house prior to the dedication of the new Vancouver British Columbia Temple. The public would be invited to visit the temple during an open house that would run from Friday, 9 April 2010, through Saturday, 24 April 2010 (except for Sundays). The temple would be formally dedicated on Sunday, 2 May 2010. A total of three dedicatory sessions would be held. Formal temple work was scheduled to commence on Monday, 3 May 2010. This page was last edited on 23 January 2012, at 15:50.